ForwardKeys, which predicts future travel patterns byanalysing 17 million booking transactions a day, has published a ranking of the top 50 countries most gripped by World Cup Fever. 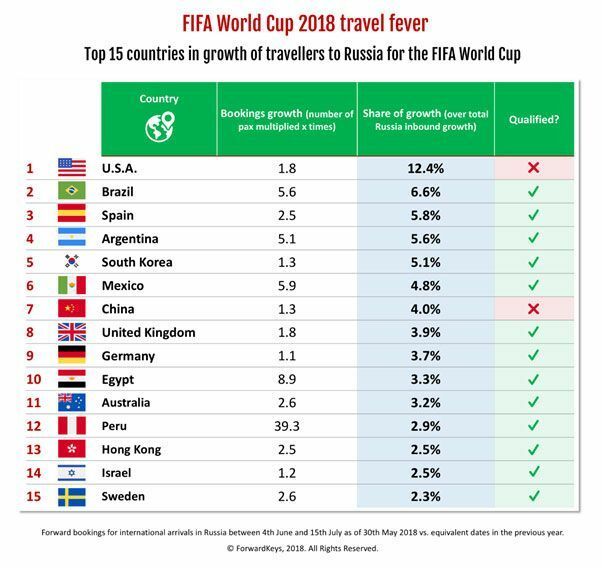 The ranking is based on the uplift in visitor arrivals to Russia from 4th June to 15th July, when World Cup ticket holders do not need a visa to enter the country. The nation at the top of the list, with the greatest number of additional visitors, is the USA. It is followed, in order, by Brazil, Spain, Argentina, South Korea, Mexico, China, the UK, Germany and Egypt. This result may seem surprising because the USA has not qualified for the finals but interest in the spot has grown strongly since the 1994 World Cup when it was the host nation. Consequently, there will be nearly twice as many Americans in Russia during the World Cup as Brazilians. ForwardKeys believes that the reasons for the USA’s high placing also include the fact that it is the largest outbound travel market in the world and that it has a sizable Latin segment in its population. However, ForwardKeys also looked at an alternative method of ranking countries, instead benchmarking them against the number of visitors that came to Russia during the equivalent period last year. On that method of analysis, Paraguay tops the list with over 52 times as many Paraguayans coming to Russia for the World Cup as visited in 2017. It is followed, in order by Peru, which last qualified for the finals in 1982, Panama, Nigeria, Tunisia, Bangladesh, Saudi Arabia, Egypt, Colombia and Morocco. One notable absentee from the top 50 list is Belgium. The country has qualified for the World Cup but it is not showing up in either of the analyses. ForwardKeys’ explanation is the collapse of Vim Airlines, last autumn, which had a sizable share of flights between Brussels and Russia so many Belgians are likely flying from neighbouring countries instead.